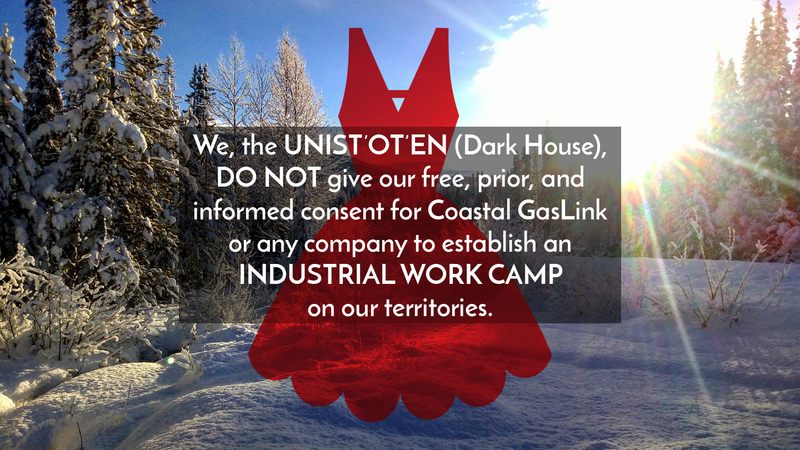 Coastal Gaslink (CGL) is establishing a proposed industrial work camp (aka: ‘man camp’) site in Unist’ot’en Territory known as Camp 9A. CGL had not even completed the required site-specific archaeological survey before they began clearing land for this proposed ‘man camp’ site. 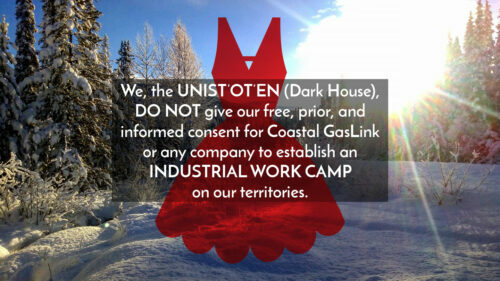 We, the Unist’ot’en (Dark House), do not give our free, prior, and informed consent for Coastal GasLink or any company to establish an industrial work camp on our territories. ‘Man camps’ are temporary housing facilities for up to thousands of mostly non-Indigenous male workers brought into different Indigenous communities for industrial work. They create the social conditions for an increase of violence against Indigenous women and children. The culture and work conditions of ‘man camps’ exacerbate isolation, drug and alcohol abuse, violence, misogyny, hyper-masculinity, and racism among the men living there. These are exactly the kind of traumatic experiences, and colonial legacies, that our people are trying to recover from at the Unist’ot’en Healing Center. Our residents at the Healing Center build resilience, establish or renew their sense of identity as Indigenous people, and enhance their sense of connection to the natural world by carrying out cultural practices on the land, including: trapping, hunting and harvesting across our territory. Erecting a ‘man camp’ mere kilometres from the Healing Center would disrupt our ability to offer a safe, therapeutic environment on our territory. Specifically, it would compromise the ‘container of safety’ we established by controlling access to our territory, keeping out violent or aggressive individuals and prohibiting drugs and alcohol. A ‘man camp’ is highly likely to introduce influences that could re-traumatize or trigger past traumatic experiences among residents and cause further harm to the vulnerable residents of our Healing Center. Colonialism and industry have deliberately targeted Indigenous women and two spirits since contact, and ‘man camps’ are yet another way that they will be violated. The Unist’ot’en (Dark House) is occupying and using our traditional territory as we have for centuries. Our homestead is a peaceful expression of our connection to our territory and demonstrates the continuous use and occupation of our territories in accordance with our governance structure. We have never ceded our sovereign title and rights over the land, waters, and resources within our Yintah. Our ‘Anuc niwh’it’ën (Wet’suwet’en law) and feast governance systems remain intact and continue to govern our people and our lands. We recognize the authority of these systems. The Wet’suwet’en Hereditary Chiefs are the Title Holders, and maintain the authority and jurisdiction to make decisions on unceded lands. The 22,000 square km of Wet’suwet’en Territory is divided into 5 clans and 13 house groups. Each clan within the Wet’suwet’en Nation has full jurisdiction under our law to control access to their respective territories. Indigenous women and two spirits are already made vulnerable by Canadian colonialism and structural racism. Indigenous women are already being murdered or going missing at a rate four times higher than the rate of representation of non-Indigenous women in the population in Canada. The national homicide rate for Indigenous women is already seven times higher than for non-Indigenous women in Canada. 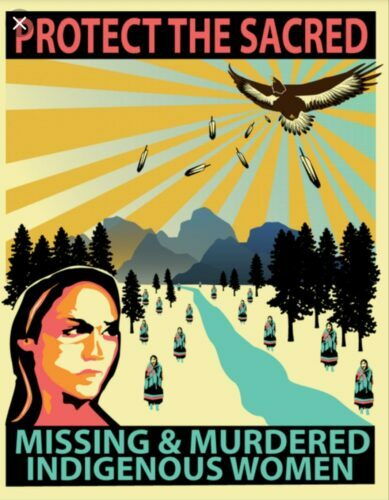 There are marches this week on February 14 across these lands to honour missing and murdered Indigenous women and girls. We, the Unist’ot’en (Dark House), know that violence on our lands and violence on our women are connected. We do not consent to Coastal GasLink’s violence destroying our lands, and we do not consent to Coastal GasLink’s ‘man camp’ and its potential to violate our women.